Ex-Big Brother Naija housemate, Gifty Powers is not happy with Uti Nwachukwu for defending Cee-C who verbally abused Tobi. 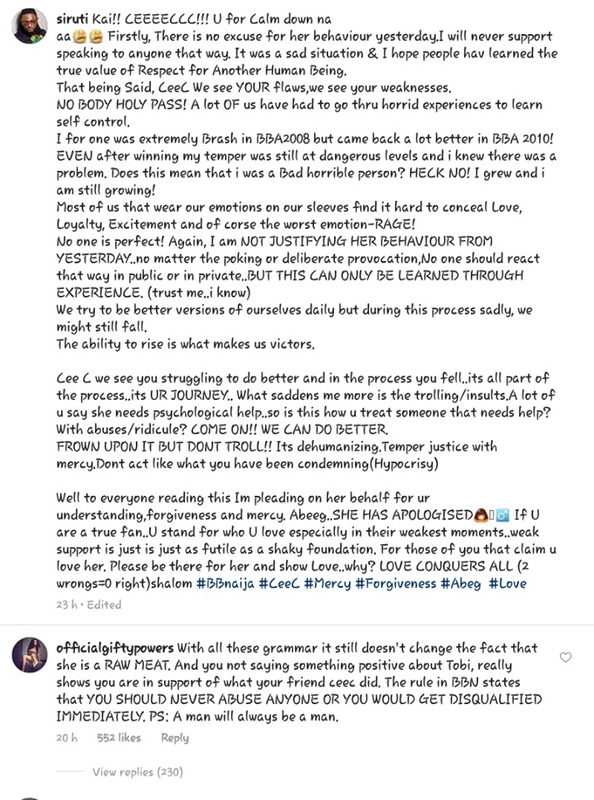 Former big brother Naija 2017 housemate, Gifty Powers has taken a swipe at a former BBA winner, Uti Nwachukwu for his seeming support for Cee-C. Recall that Cee-C had some days ago verbally abused Tobi for over an hour over an incident. 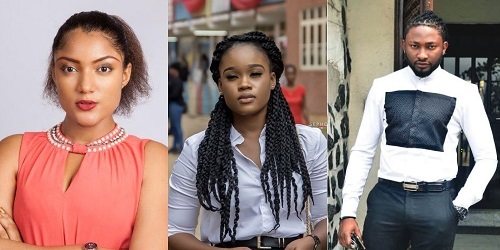 Uti had taken to his page to defend Cee-C saying that she is human after all and everyone is bound to make mistakes. aa Firstly, There is no excuse for her behaviour yesterday.I will never support speaking to anyone that way. It was a sad situation & I hope people hav learned the true value of Respect for Another Human Being. That being Said, Cee-C We see YOUR flaws,we see your weaknesses. NO BODY HOLY PASS! A lot OF us have had to go thru horrid experiences to learn self control. I for one was extremely Brash in BBA2008 but came back a lot better in BBA 2010! EVEN after winning my temper was still at dangerous levels and i knew there was a problem. Does this mean that i was a Bad horrible person? HECK NO! I grew and i am still growing! Most of us that wear our emotions on our sleeves find it hard to conceal Love, Loyalty, Excitement and of corse the worst emotion-RAGE! We try to be better versions of ourselves daily but during this process sadly, we might still fall. The ability to rise is what makes us victors. Cee C we see you struggling to do better and in the process you fell..its all part of the process..its UR JOURNEY.. What saddens me more is the trolling/insults.A lot of u say she needs psychological help..so is this how u treat someone that needs help? With abuses/ridicule? COME ON!! WE CAN DO BETTER. FROWN UPON IT BUT DONT TROLL!! Its dehumanizing.Temper justice with mercy.Dont act like what you have been condemning(Hypocrisy)."